A zoologist is a scientist who studies animals, whether slugs or spiders, rattlesnakes or ravens. Most zoologists work at universities where often they also teach biology. Others work as government biologists for the Forest Service or the U. S. Fish and Wildlife Service, for example. Others work for nonprofit environmental organizations or private companies that do environmental impact reports. A few write about science for the public. Zoologists may study animals in a laboratory or in the wild. For example, a zoologist might go to Africa several times a year to study the social behavior of hyenas. The zoologist catches individual hyenas and puts collars on them that carry radio transmitters. Each transmitter emits a different signal, so the zoologist always knows where each hyena is. This not only allows the researcher to map the movements of each animal, but to find the animal when necessary. Zoologists also breed animals in captivity. In captivity, animals rarely behave the same way that they do in the wild, but it is easier to do experiments under controlled conditions. Whether in the lab or in the field, zoologists study the behavior, evolution, ecology, and physiology of animals. Many zoologists study how one species interacts with another or how plants and animals "coevolve." Zoologists who study behavior or physiology often study animals mainly in a laboratory. 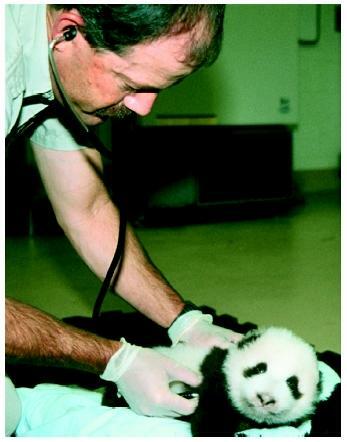 A zoo veterinarian examines the San Diego Zoo's female giant panda cub in October 1999. Almost all zoologists have at least a bachelor's degree in biology, zoology, ecology, or a similar field. Many zoologists have a master of arts (M.A.) or a master of science (M.S.) degree. University and college professors almost always have a doctor of philosophy (Ph.D.). Often, zoologists who work for the government must pass an exam in a field such as wildlife biology. High school students interested in a career in zoology should take math classes, through calculus, and explore nearby natural areas, learning the names of the plants and animals. Crompton, John. Ways of the Ant. New York: Nick Lyons Books, 1988. Owens, Mark, and Delia Owens. Cry of the Kalahari: Seven Years in Africa's Last Great Wilderness. Boston: Houghton Mifflin Company, 1984. Steinhart, Peter. The Company of Wolves. New York: Knopf, 1995.
how much money did he get after going their?i just wanted to ask because i want to become a zoologist one day. would it be a good idea if i changed from veterinarian to a Zoologist. i love working with animals but i just love to help exotic animals like lions, Zebras, etc. this is not a child dream like i want to be an Astronaut. i am a High school student and i am trying to find the right path. ive wanted to be a vet but now im thinking about a zoologist now. what are the different jobs to do. i know the basics but how do you get to CARE for the animals-give them shots.